Waking up in the morning is not as pleasant as it could be. Loud rings, beeps and tones shatter the silence – and your sleepy relaxation from the night before. 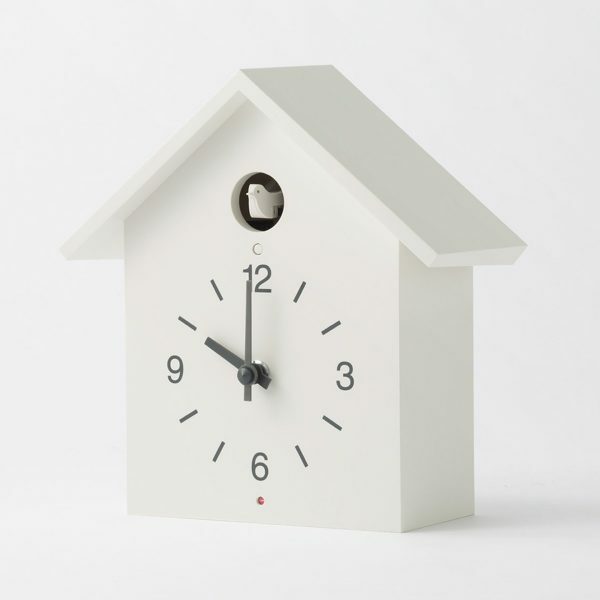 Yet, alarm clocks have come a long way – and developed many more benefits than they might have had in the ‘80’s. These days, you can forgo batteries, charge your iPhone, create an art piece, or even tell the time in words with the help of new innovations. Our top 50 list of alarm clocks detail the new tasks your alarm clock can perform – in stylish, gift-worthy centrepieces to adorn the most basic of bedside tables. 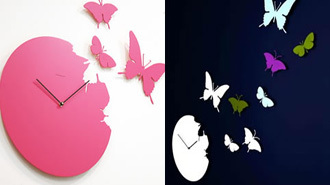 Take a peek to choose a differently-rising clock in the New Year. 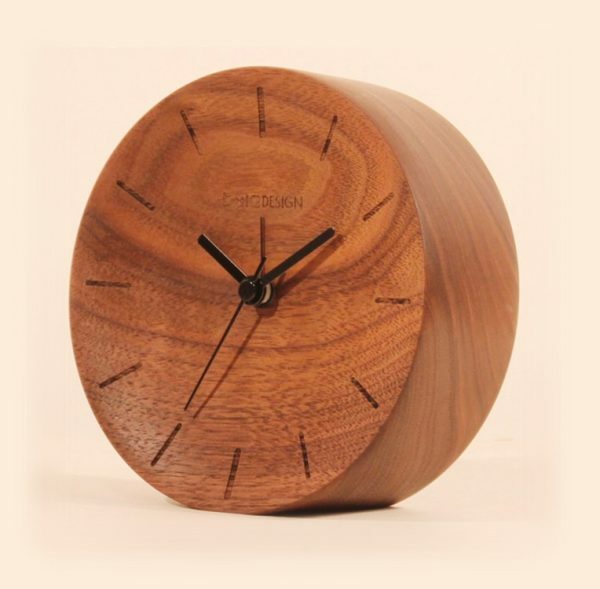 Round Wooden Walnut Desk Clock: Roll out and up from the bed with this circular walnut clock, a perfect fit for your desk or office table. 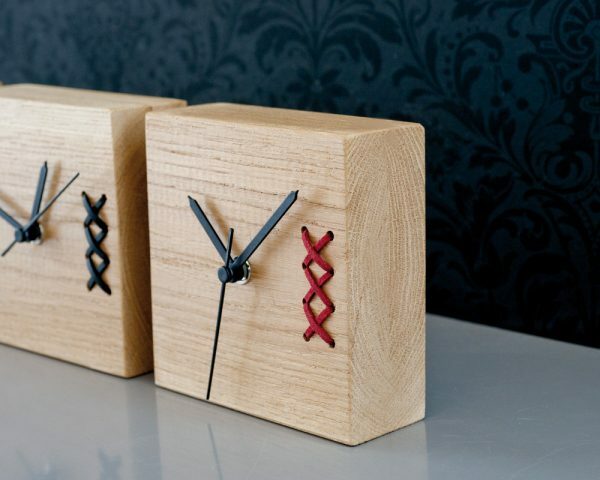 Wooden Embroidered Clock: Inspired by the idea of creating connections, these wooden squares interlaced with thread are made by hand in Israel. 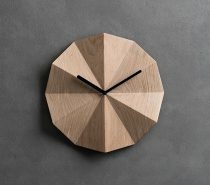 Minimalist Triangle Bamboo Clock: Made of bamboo, these nifty triangles shine the time, date and temperature via a green LED light. 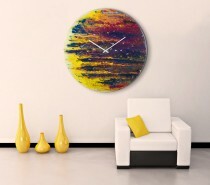 Beautiful Wood & Paper Clocks: Available in a range of colours and patterns, wood and paper mesh together in many artsy designs for your living or bed room. WWII Double Wasp Radial Engine Piston Desk Clock: Created using an authentic ‘40’s Double Wasp Radial Engine Piston, this clock was once part of American WWII aircraft artillery. Coming complete with past war scars and machine-gun pitting, each clock is custom made to order. 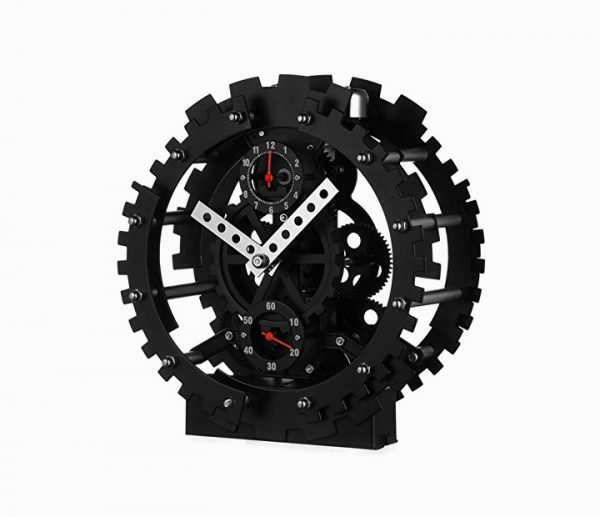 Gear Desk Clock: As this clock ticks time, its moving gears move in a different motion. 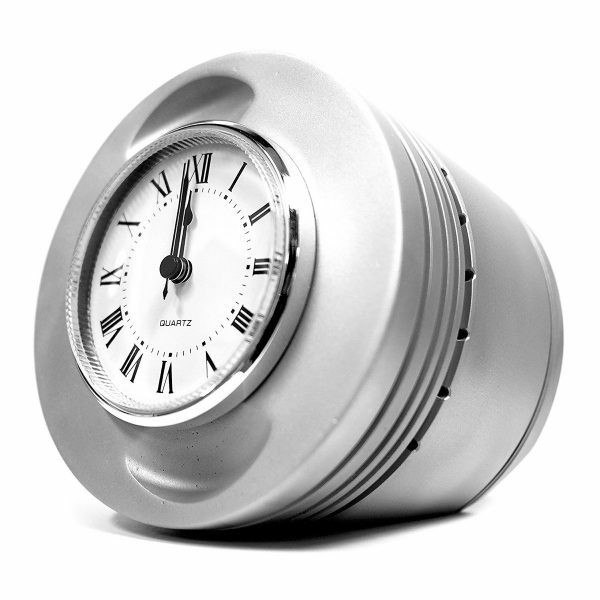 A great gift for the mechanic in your life, this clock would be a fitting time keeper for a workbench. 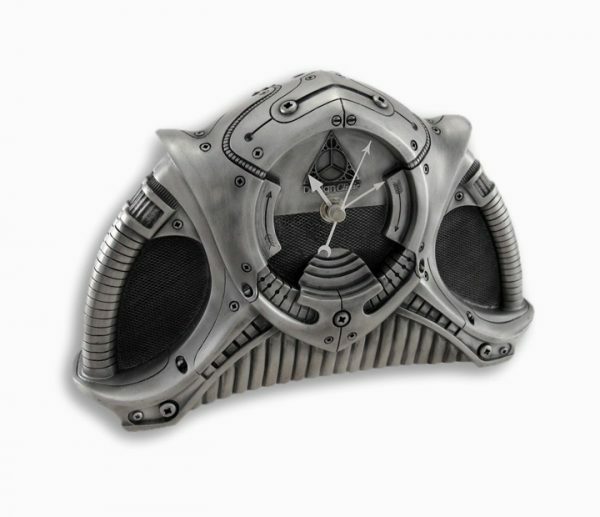 Industrial Clock: Made of cast resin, this time machine looks like a spacecraft’s steering wheel, but acts like a clock. 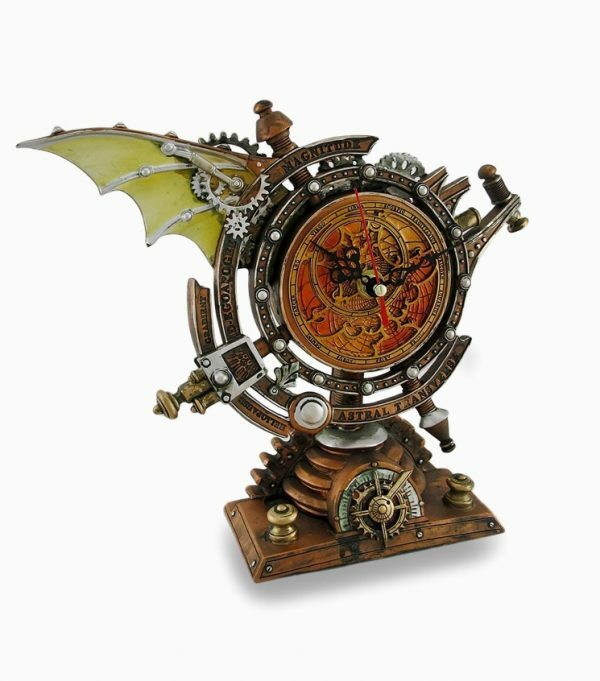 Steampunk Style Desk Clock: Hand-painted to mimic metal, this complex creature could stake a claim amongst the widest collection of steampunk home décor. 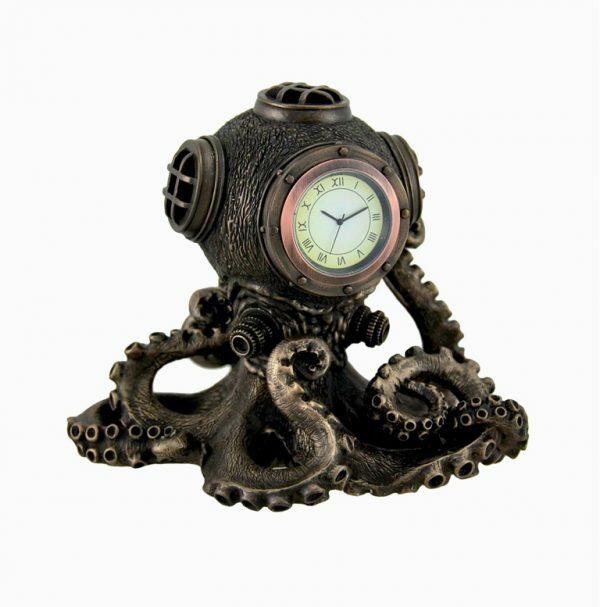 Octopus Desk Clock: Go under the sea with this unique octopus clock, made of cold-cast resin with an antique bronze finish. 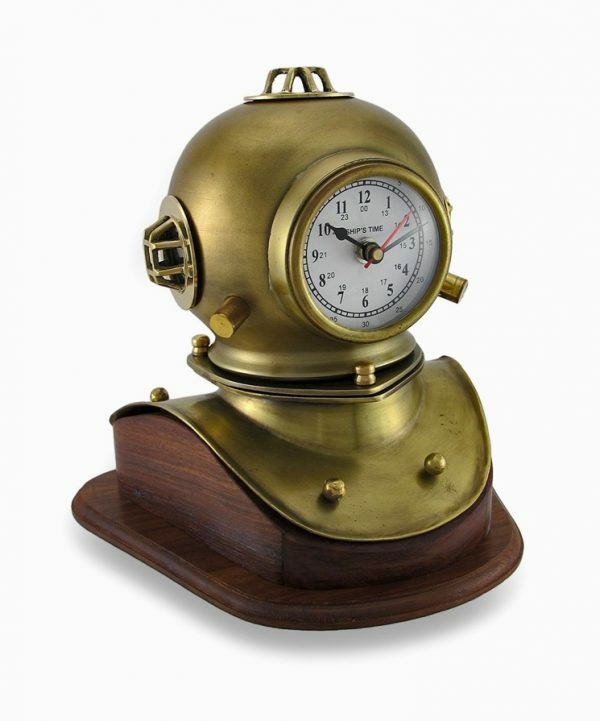 Nautical-Themed Desk Clock: Get prepared for underwater adventures with this golden diver helmet clock. 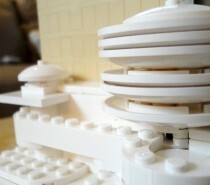 Its thematic ticker is powered by quartz. 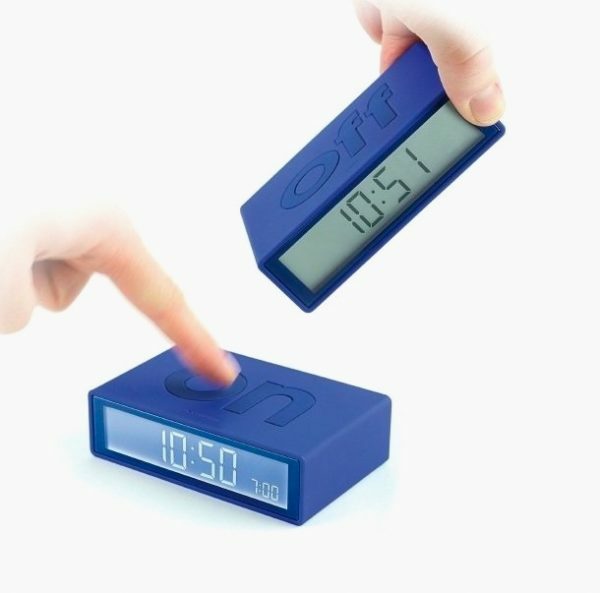 Flip On/Off Clock: Save precious snooze time by simply turning this alarm clock on its side. A simple flip turns it on or off. 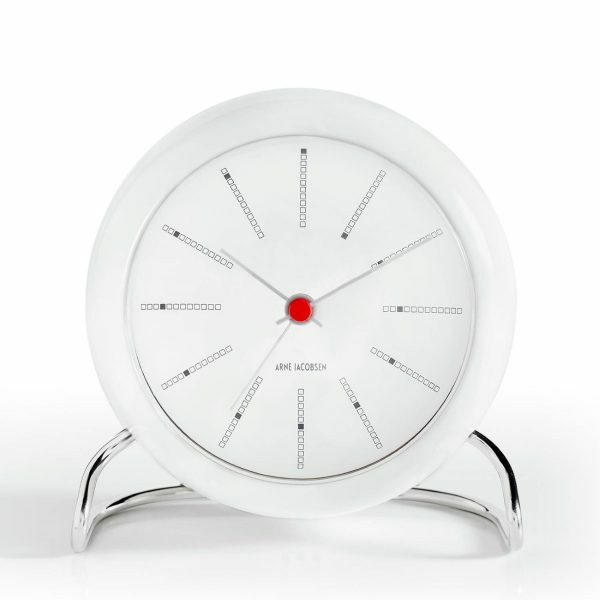 Arne Jacobsen Bankers Table Clock: Made in Hong Kong, this white and steel piece with central red fixture is a great minimalist find. Iconic Mondaine Clock’s Table Version: A Museum of Modern Art-honored design, this timepiece watch was officially licensed for $21 million by Apple – for their iOS 6. Make it your own, with a nifty night light and alarm included. 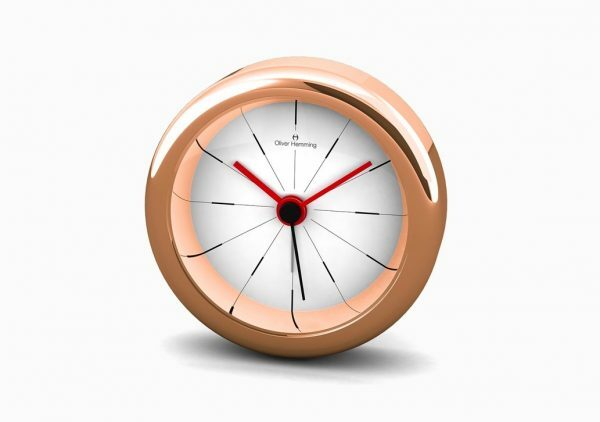 Rose Gold Finish Minimalist Desk Clock: Roll into travel mode with this stylish rose-gold desk clock. Its miniature size is a perfect fit for your suitcase. 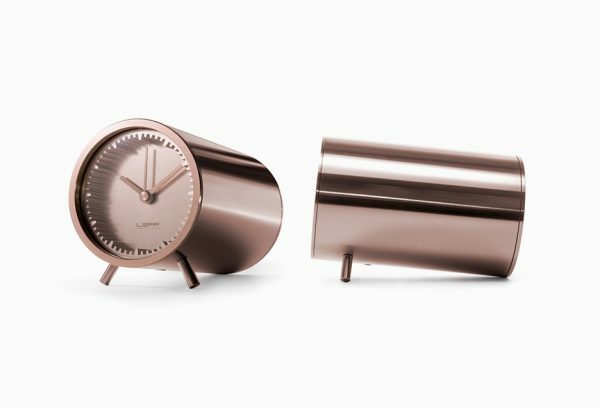 Tube Clock: Inspired by a metal tube and extrusion ring, this Piet Hein Eek clock looks like it moulds materials together – but in reality tells a metallic version of the time. 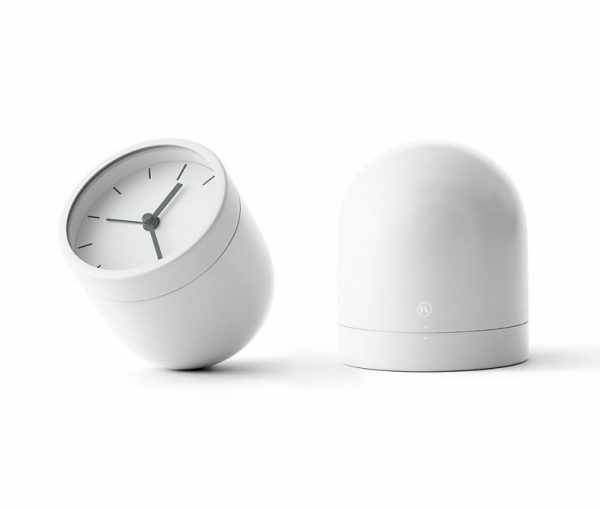 Tumbler Alarm Clock: Defying gravity, this tumbler clock tilts and wobbles, but won’t fall down. Use it in the kid’s room, to wake them up for school time. 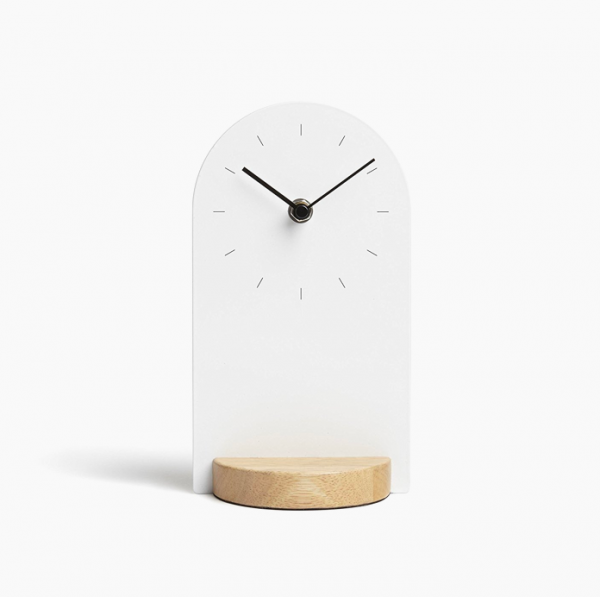 Architectural Desk Clock: Designed by Sung Wook Park, this mixed-material find raises a plinth on your bedside table. 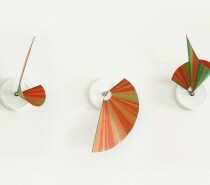 Small Cuckoo Desk Clock: Cuckooing every half hour, this small wooden beauty turns off in the dark. 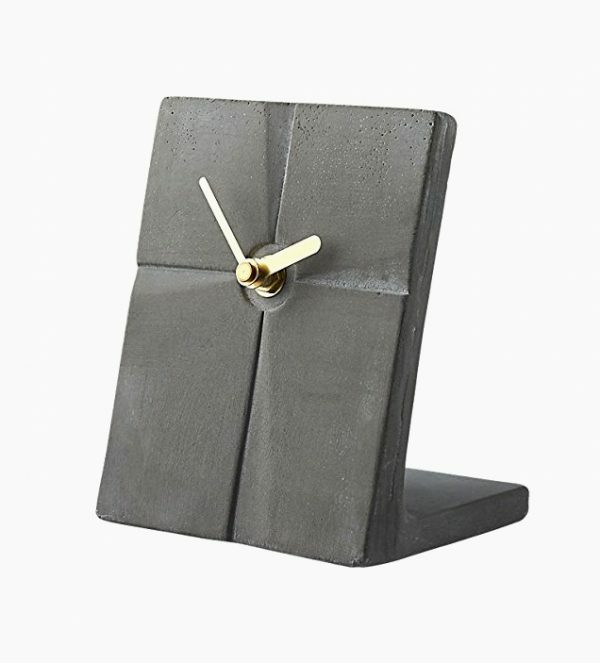 Concrete Desk Clock: Prop up a cement slab on your desk, for an industrial-looking office. 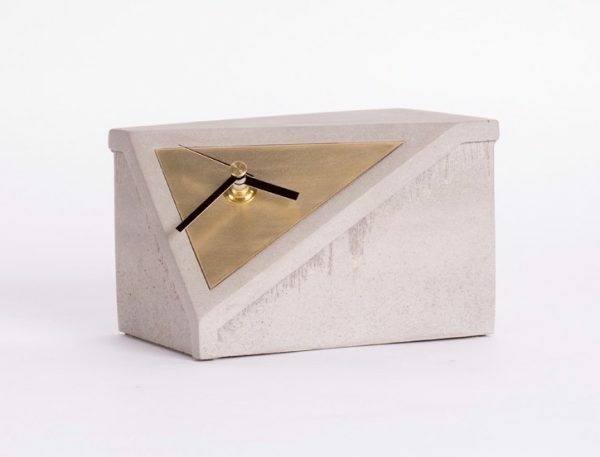 Concrete Brass Desk Clock: Take the diagonal path to time telling with this concrete and brass clock, a stunning addition to any home office. 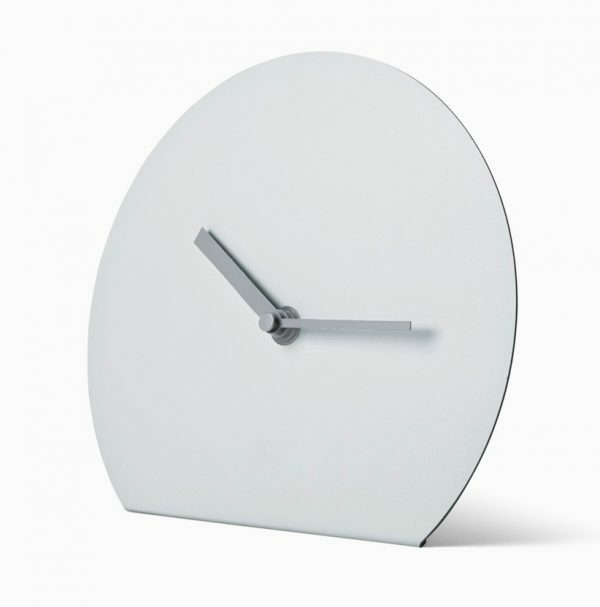 Minimalist Scandinavian Clock: Create an optical illusion with this steel Scandinavian timepiece, a minimalist ornament for your bedside table. Hourglass Clock: The sands of time run through this unique clock, which tells the time on two different axes. 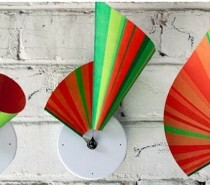 Retro Flip Clock: Make your office a grandstand, as time flips through number panels from the ‘60’s. 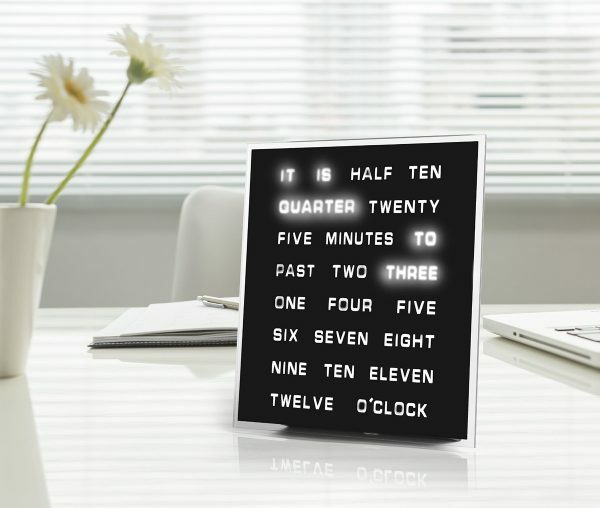 Clock With Words: Displayed in five-minute intervals, this clock chooses words over numbers to tell the time. Gift it to the wordsmith you just don’t know how to buy for. 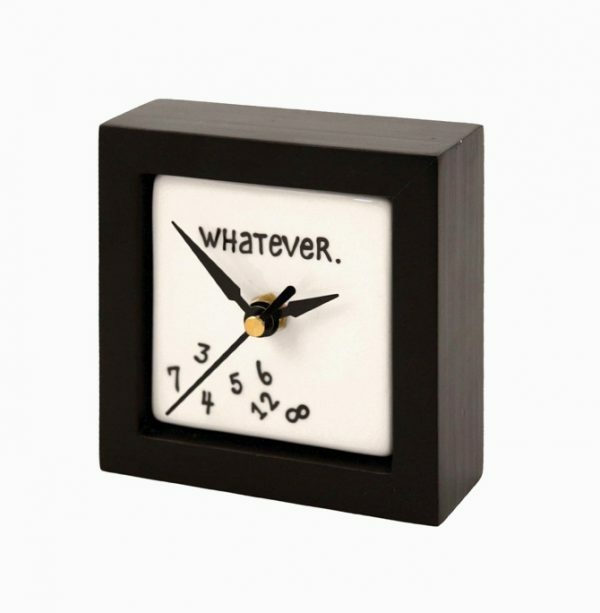 Whatever Desk Clock: ‘Whatever’ time is engraved on this hand-crafted clock in a box design. 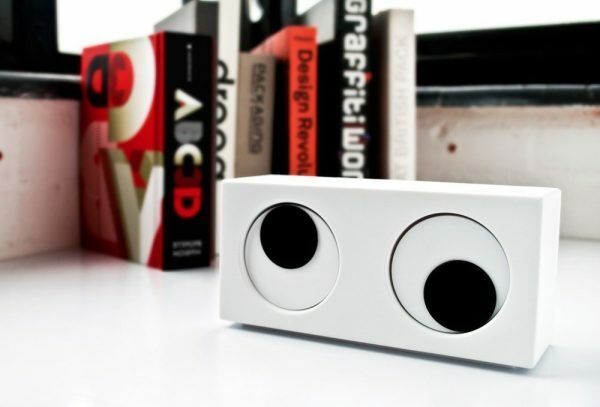 Crazy Eyes Clock: Sure to amuse the kids, this clock tells the time with its eyes – crazy, funny eyes. 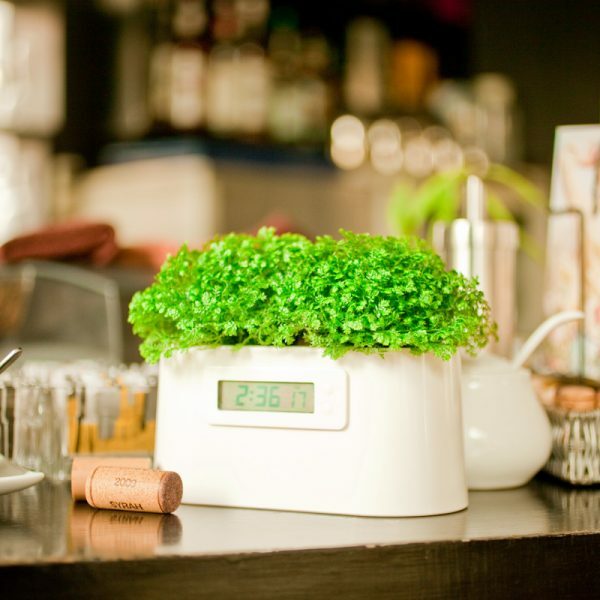 Planter Clock: A small plant powers this clock, without the need for batteries. Save the environment and provide an office talking point – at the same time. 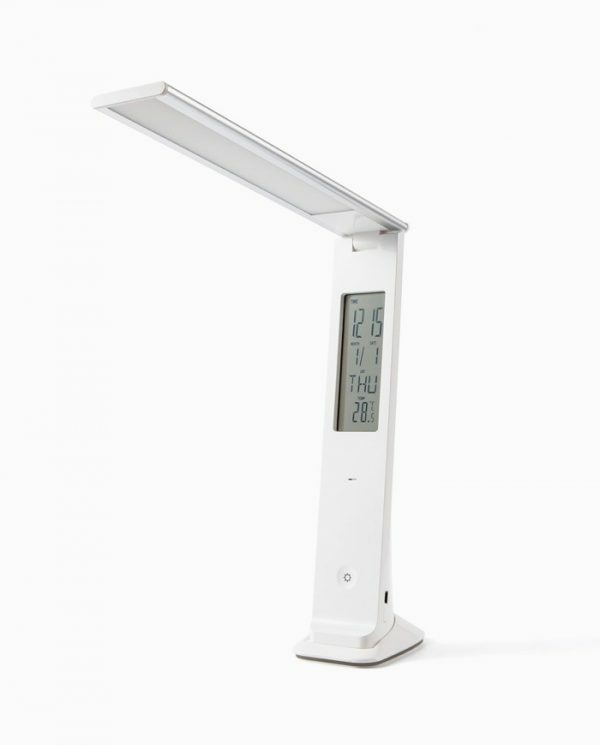 LED Table Lamp With Digital Clock: This functional piece lights up the details you need to see, while presenting the time you need to do it in. 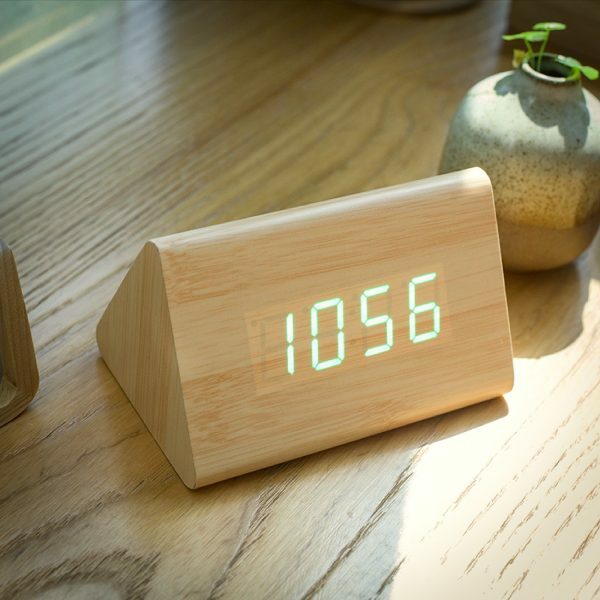 Multi-Function Desk Clock With Wireless Qi Charger: This smart unit is more than just a desk clock. Incorporating a Bluetooth speaker, alarm, thermometer, music player and phone charger, the device itself is charged wirelessly. 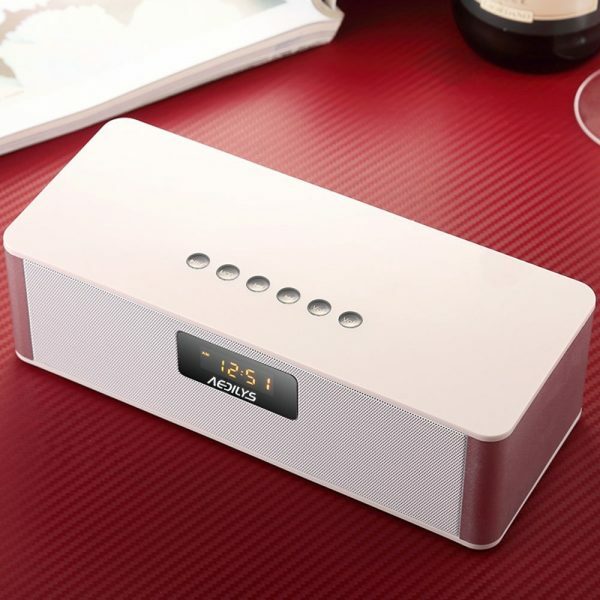 FM Radio Alarm Clock With Bluetooth Speakers: Let a surround sound FM radio play sweet tunes to you in the morning. 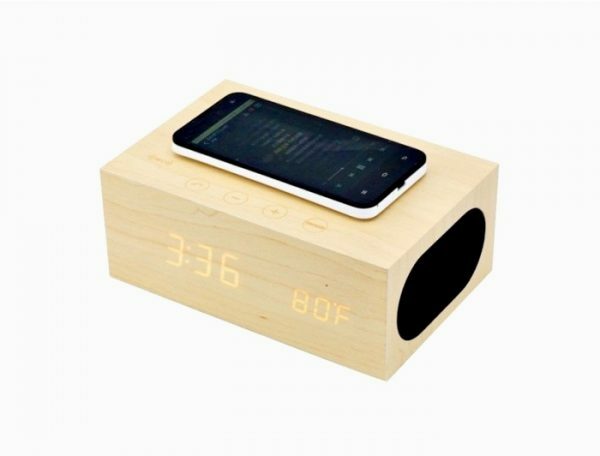 This alarm clock with Bluetooth speakers takes the hassle out of waking up. 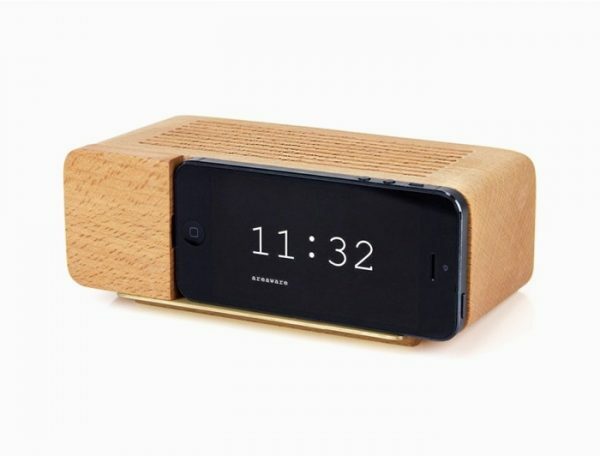 Decorative Alarm Dock For iPhone: Create a nifty nook for your iPhone 5 with this clock designed to house and charge it. Although specifically made for iPhone 5, it can also charge newer models. 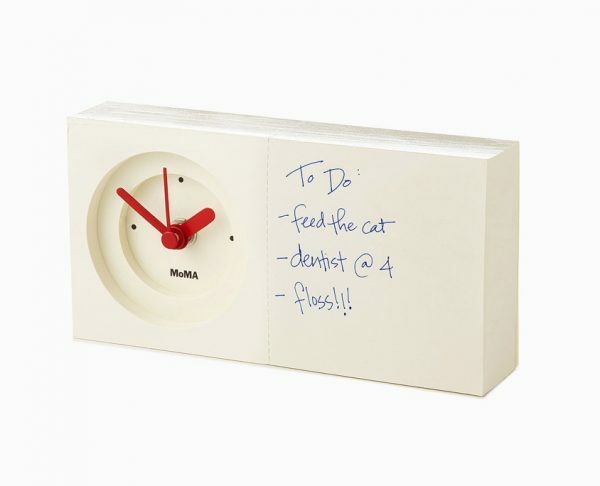 MoMA Notepad Desk Clock: Tired of straying Post-It notes? 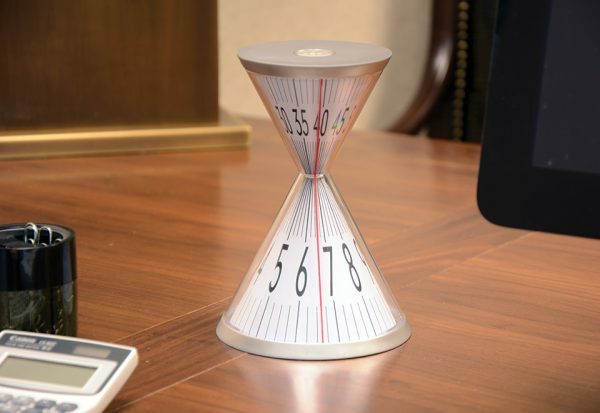 Combine your desk clock and notepad into one, with this fitting find. 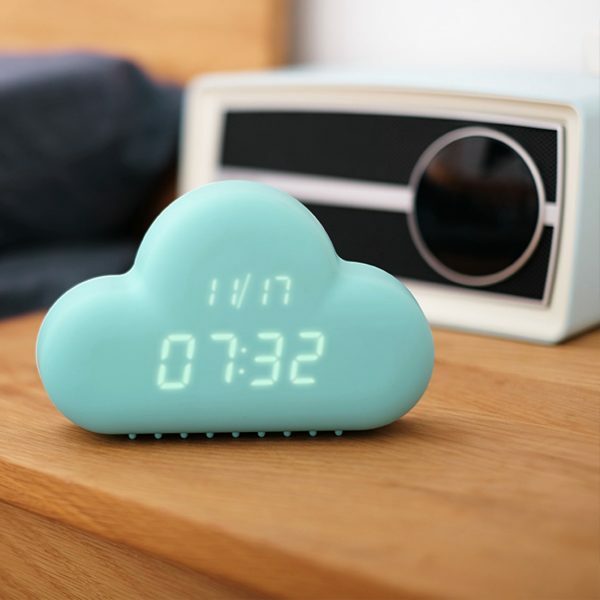 Cute Cloud-Shaped Clock: Hang this little cloud on your desk or wall, to chase the bad work day clouds away. 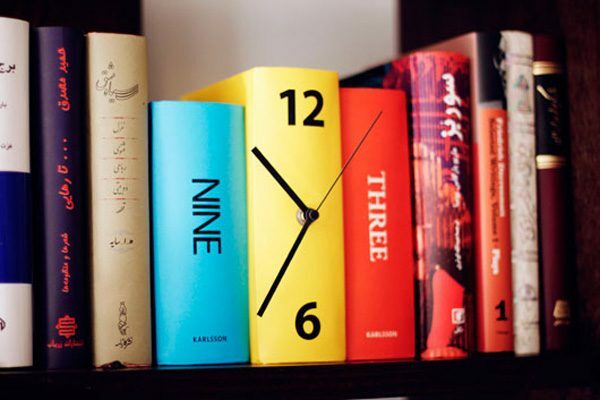 Book Clock: Hide a clock inside your library for the office book lover to find. 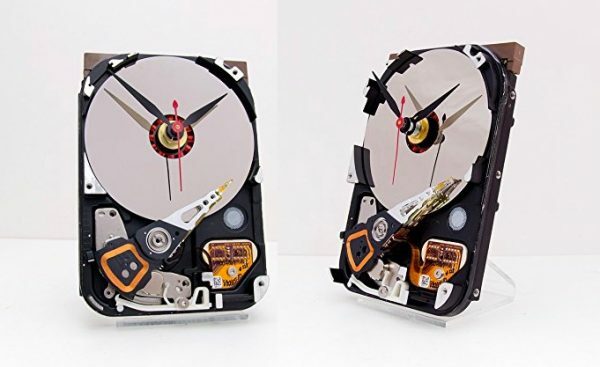 Hard Drive Clock: Want someone to spend less hours in front of the computer? 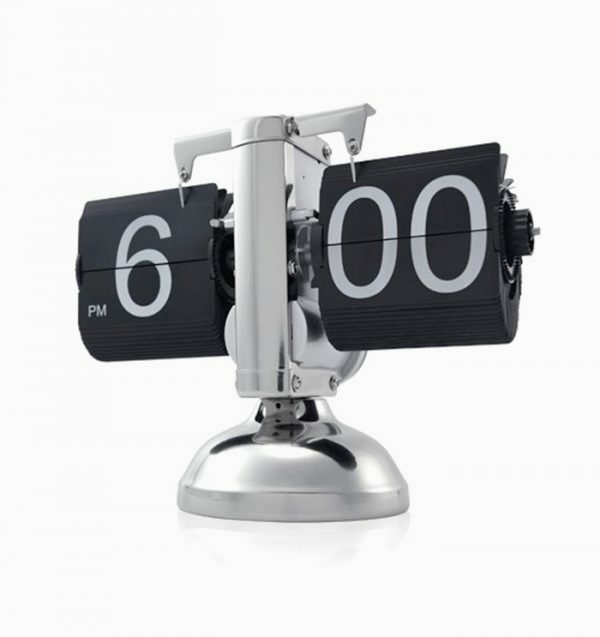 Speak to them in a language they understand – with a hard drive clock upon their desk. 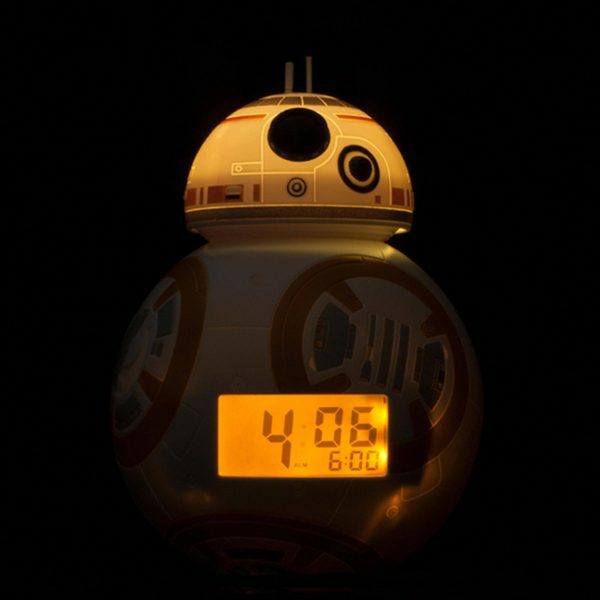 BB-8 Alarm Clock: Inject some Star Wars madness into your office, with this lit BB-8 alarm clock in Santa’s wish pile. 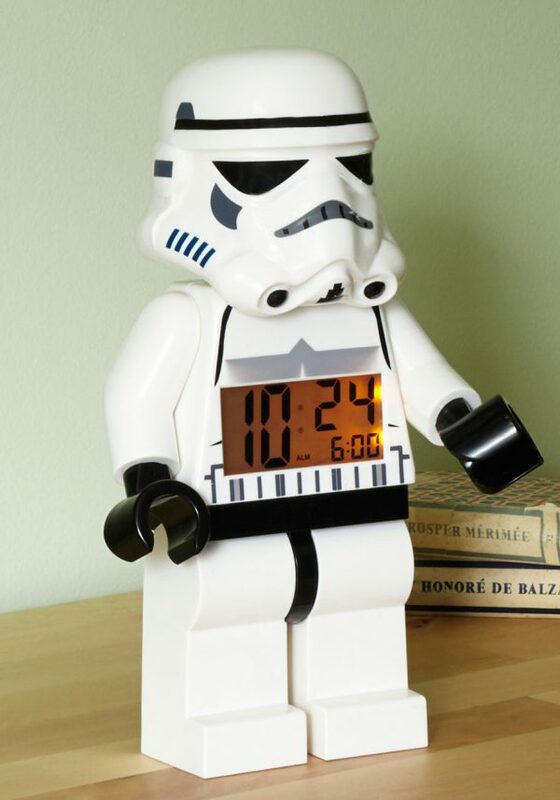 Stormtrooper Clock: Stormtroop your way into a Star Wars fan’s good books, with this nifty clock-bearing addition to add to their collection. 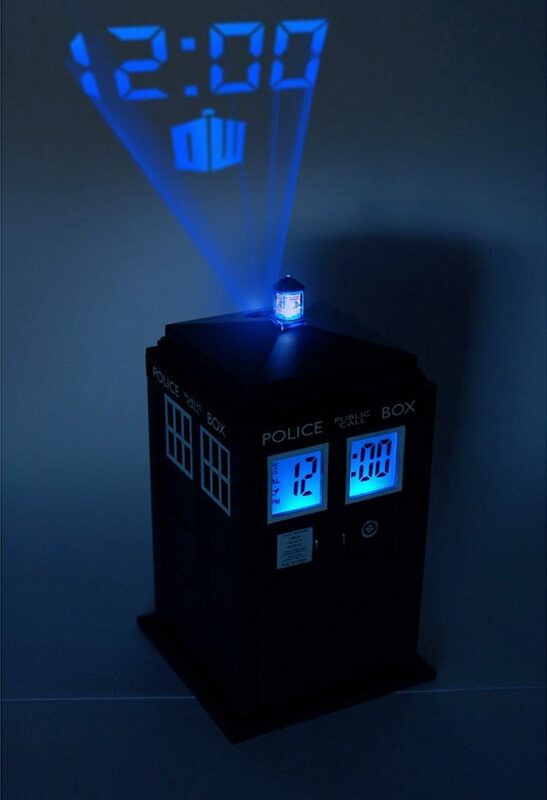 Doctor Who TARDIS Projection Alarm Clock: Wake up a Doctor Who fan, with a flashing siren and TARDIS noise upon wake-up time. 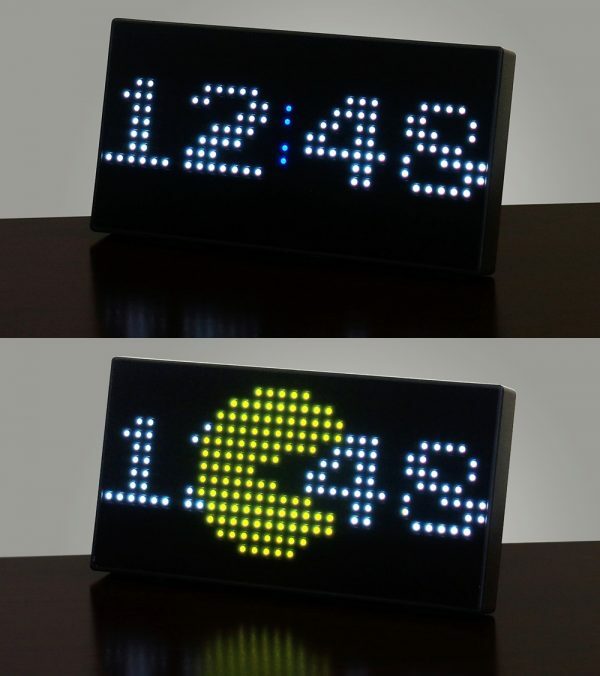 Pacman Digital Desk Clock: Watch Pacman eat ghosts and the time with this retro desk clock for the modern gamer. 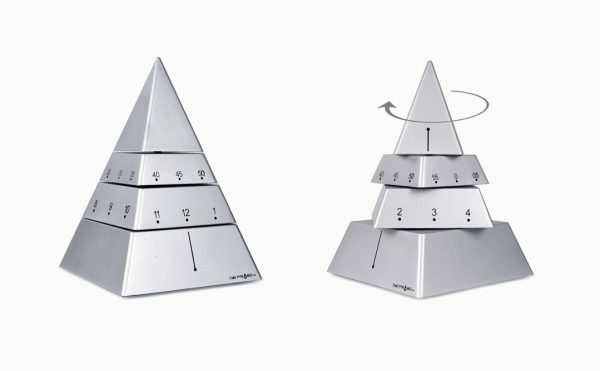 Sculptural Pyramid-Shaped Rotating Clock: An innovative way of showing the time, this constantly-rotating pyramid makes a perfect form every three hours. 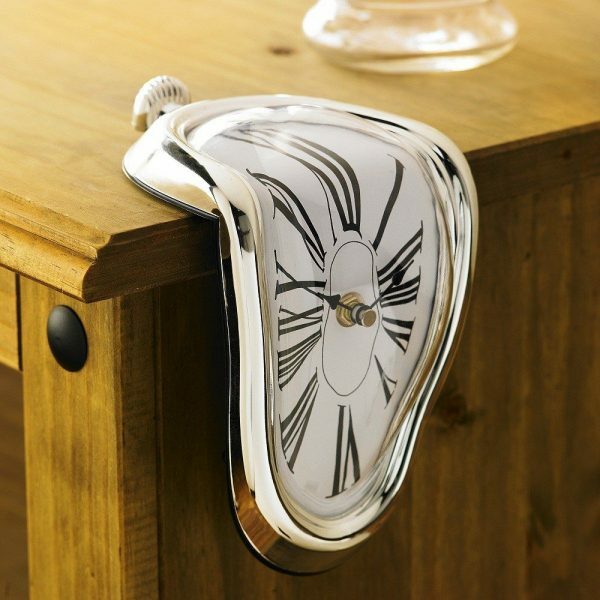 Salvador Dali-Inspired Melting Clock: The Surrealist fan would appreciate this Dali piece come to life. A place in the home library or office would do it justice. 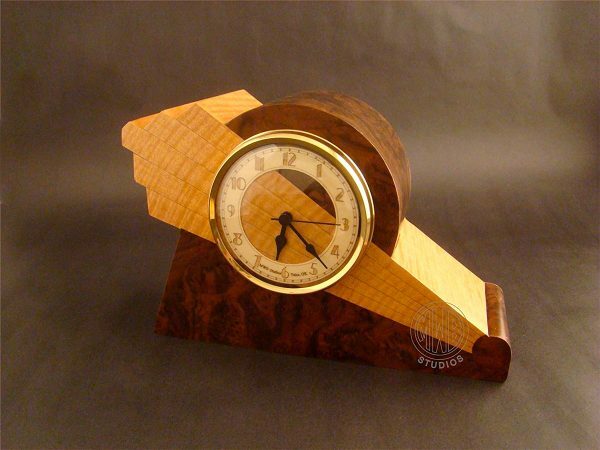 Art Deco-Style Clock: Made of walnut, maple and holly, this American-made timepiece is an inspirational addition to the office. 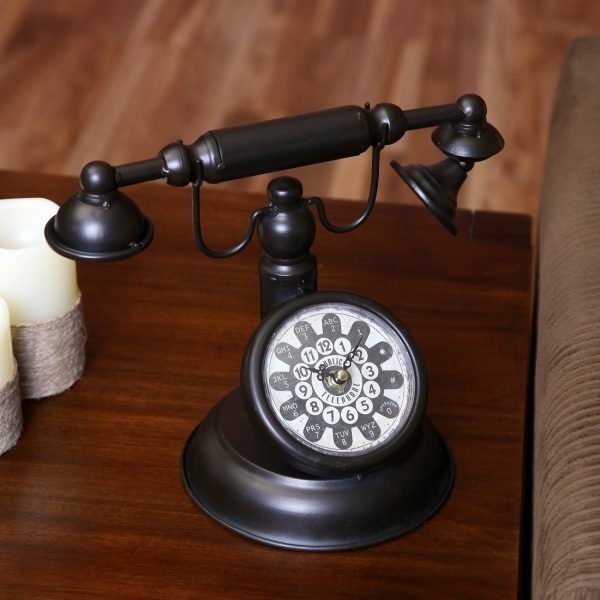 Antique Telephone Clock: Confuse customers and overnight guests with a phone that really tells the time. Play a phone ringing sound for some humorous interaction. 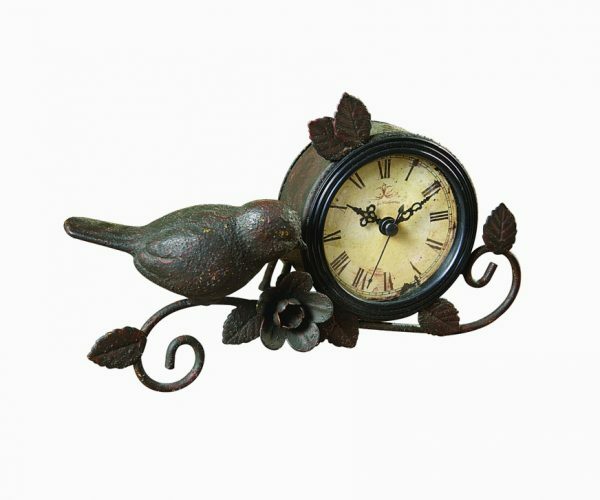 Cottage Chic Desk Clock: Love all things antique? This bird-and-flower design might tickle your fancy. 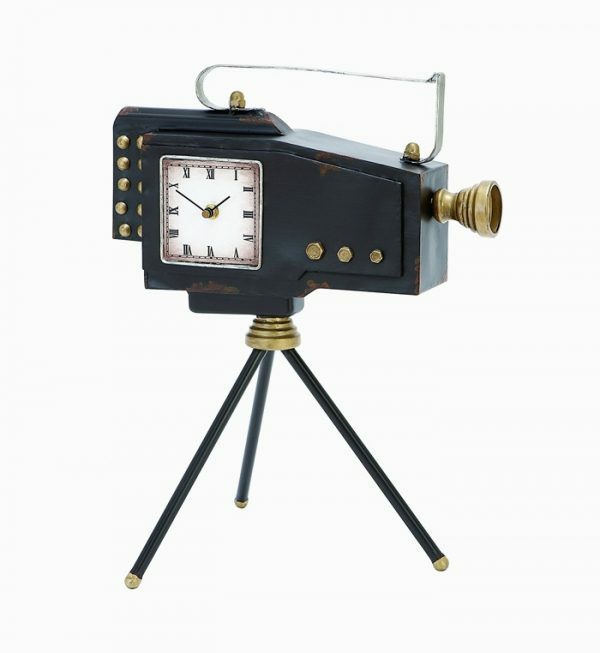 Antique Camera-Shaped Clock: Photography fans would appreciate this antique camera hiding the time in their home office collection. 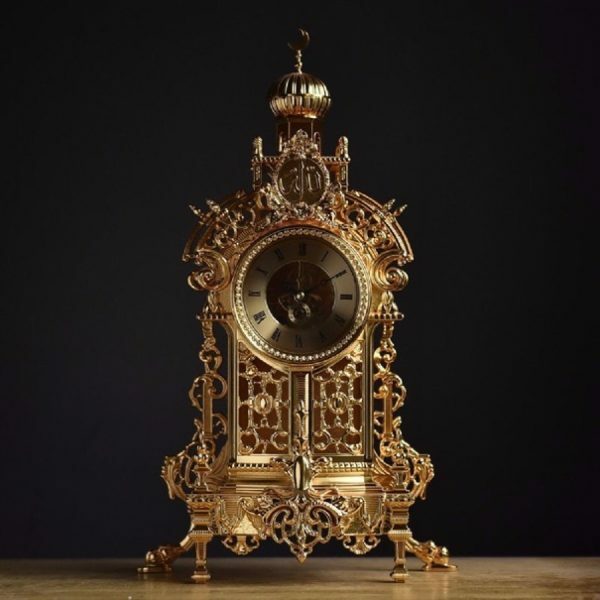 Antique Brass Finish Clock With Rotary Dial: Walnut and brass adorn this antique rotary creation, a find for the lover of all things olden. 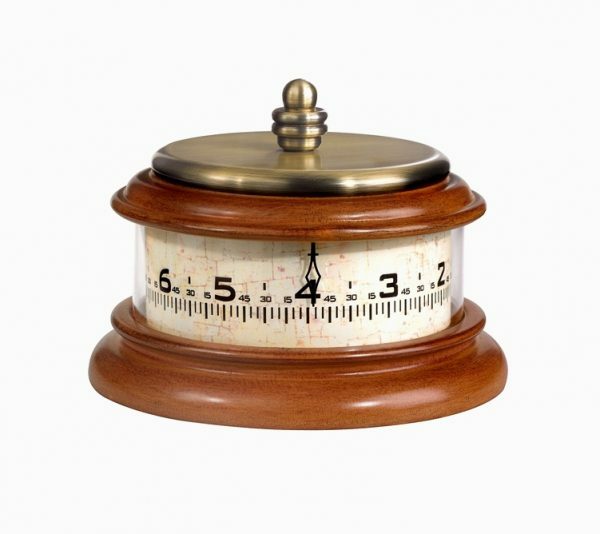 Victorian Desk Clock: Give the gift of gilt with this desk clock alluding to things Victorian. 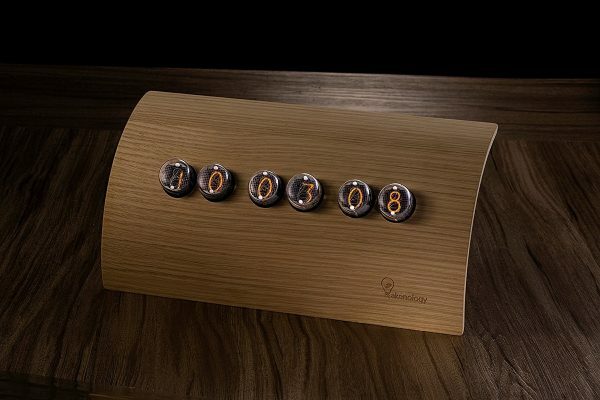 Nixie Tube Clock: Choose a time or date display in these retro tubes. 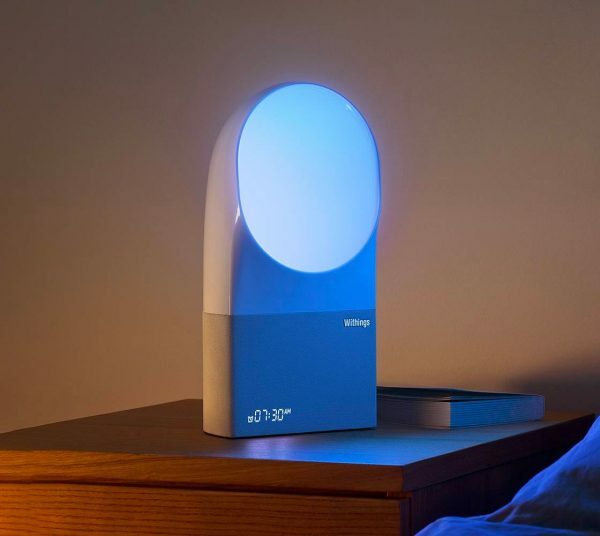 Withings Smart Alarm Clock: Synced to your smartphone, this smart alarm awakens your senses with soft light. A soundtrack plays instead of bells, which can be a song or compilation of your choosing. 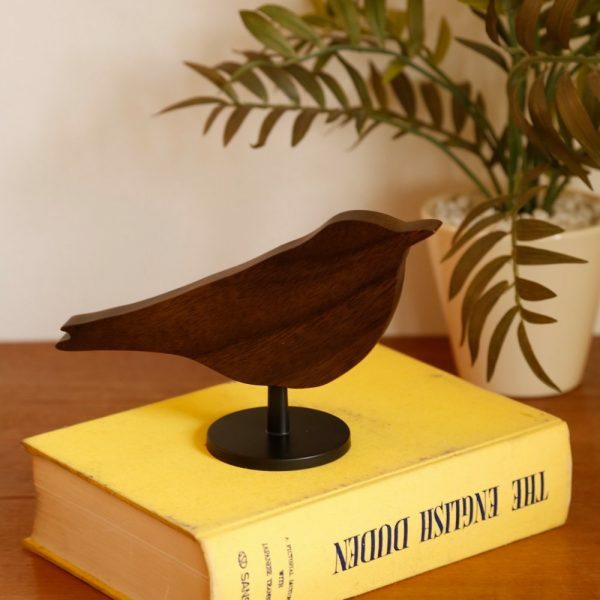 Bird Alarm Clock: This cute wooden bird hides all alarm clock necessities in one pretty package.